I noticed many of the books I've read recently have had apocalyptic backgrounds or culminations, so I wanted to turn the tide a bit with this one. Also, after the last cover reveal I thought it best to show a cover that is beautifully done. Some of the world's most talented SF writers (including Alastair Reynolds, Kay Keyon and Jason Stoddard) show how things can change for the better. From gritty polyannas to workable futures, from hard-fought progress to a better tomorrow; heart-warming and mind-expanding stories that will (re-) awaken the optimist in you! I love the coloring and contrasting look. Below is the art without the type. If anyone knows the artist please let me know. This is definitely high on my list to check out next year among the many other anthologies currently slated. 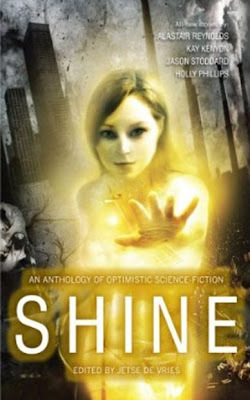 Shine will be released in March 2010 from Solaris Books. 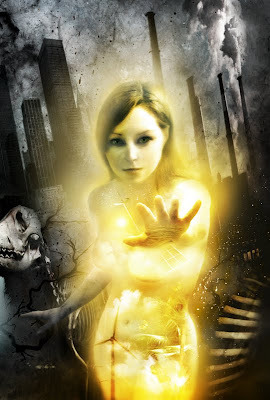 That's an awesome cover - intriging.